Audio = Stream the audio in two parts from the long bars below. 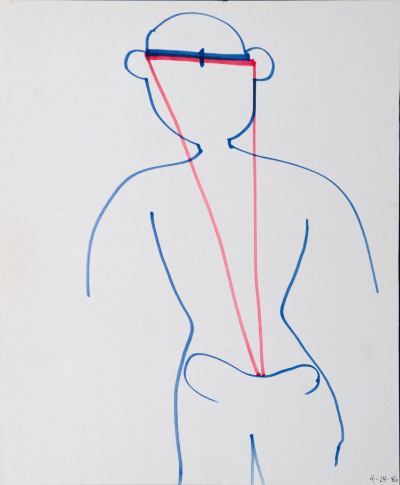 [METHOD: Ref: Diagram (human figure with inverted triangle: base between ears as line level consciousness, and apex in center of pelvic girdle). Two steps: be aware that the triangle physically exists; continually feel it. 2) keep it balanced at all times--both inwardly and outwardly. Keep the line of consciousness base over the apex located in the pelvic center. You cannot physically suffer or otherwise be you if you are mindful of keeping the triangle balanced. This allows a kind of scanning/neuralizing from a nondirectional center of the plane of consciousness. Consciousness w/o an object vs. consciousness of. TASK: for new videotape watchers--reversal of current with your mechanical opposite. Return energy in imitation of the opposite's ordinary mode. Ideas are a kind of food -- they are a specific kind of energy. Ideas should be chewed most carefully and thoroughly with three sets of teeth. Everything you put in your mouth, in the realm of more physical food, you either like or don't like. We are back to the great binary world. If it is tasteless then you forget about it, but that is another matter. The only thing of interest about food is that it is either tasteful and pleasing, or that it is not tasty. The ingestion of physical food is mechanical and binary in all creatures that eat. When speaking about the ingestion of food energy on the level of ideas, you cannot operate on the basis of chewing either this way or that way, approving or disapproving your diet. That is not a thorough chewing. It will not lead to any profitable digestion or use of any ideas you hear from anyone, or anything you believe you have observed about Life. Binary chewing will keep you alive in the same way that a steady diet of cream of celery soup will. You can't put on any muscular structure with that kind of physical food. Likewise you cannot, from your ordinary observation, reading, and so-called thought processes, build any new muscle or do any exceptional neural workouts. You cannot expand your understanding when operating on the basis of chewing your food with two sets of teeth. People will not grow when they take in ideas on the basis of "I like what I hear, what I just read." When you say, "I like that" or "I don't like that" to whatever flows in, whether it be light waves altering the molecular structure of your brain through physical eyes, or comments you heard from a lecturer (which creates a different kind of molecular activity in your brain), you have killed any potential for expansion. Such ordinary digestion will only barely keep you alive. Real growth demands more than simply ingesting information. To grow you must have the ability to use incoming impressions. It's not the expansion of knowledge itself, but the expansion of the knowledge receptors that make human growth possible. It's not the kind of food that you take in as ideas, it's what you do with it. At times in the past it was useful for apparent prophets, when speaking to large numbers of people, to convey that the words themselves were of supreme, supernatural importance. The words and ideas of these religious people seemed to have some kind of impact on a small number of people, but in dealing with large groups those same words did not specifically, in a day-to-day sense, have an individual affect on those hearing them. The words of certain religious leaders in different time zones did have an effect on the large general scheme of humanity; all of the world's religions have altered the molecular structure of large numbers of people. But this change was not noticeable on an individual basis. This is right before humanity's eyes and they still cannot see it -- words themselves do not have a wide range of molecular effect. Words may have a schematic effect on large numbers of people. I would use the term "cultural" but too many of you would take it in the ordinary sense. Sometimes even nations get formed around some religions. Individually, though, words have no specific effect, other than for a small number who were around when the religion was concocted, and the first maps were drawn. Let me pull your attention in two or three different directions, along this particular quadrant of my strange folded and torn picnic map. Does humanity, in fact, have any freedom at all? Or do those who understand humanity's situation have to tell little white and little polkadotted lies to make it appear that change is possible? A map, or some sort of mystical system based on the message that no one can do anything would attract only 2 types of persons. And you would not want to associate with either of them. The ordinary senses tell everyone that change is possible. People hear this not just externally, but within, from their own partnership. Everyone has a continuing sensation, varying slightly from person to person, that "I should change." This sensation is accepted by everyone as proof that humanity has some freedom. People view themselves as the product of some set of dynamics which was already in motion, and people today define that set of dynamics as "the environment." They believe "such and such has made me an over-eater, or under-achiever, or over-drinker. But this situation just shows that change is possible, that there is some amount of freedom, because, regardless of any kind of philosophical theories and debate, I personally now feel the need to change." But where did the "I" of this person get the motivation to change? At the ordinary level of consciousness, where everyone is born and is doomed to operate, people must operate in a binary fashion. Otherwise they could not be conscious. Binary thought dictates there be a continual running of sentences with periods: "I've got to quit eating when I'm not hungry. I've been this way since I was a child." -- period. "I know I can change because I realized the need to change." -- period. This is being ordinarily conscious. If everyone did not start off in a binary fashion at this level, with an "I" and then another part of oneself, there would appear to be a closed loop, a closed system, with nowhere to find a starting place to even say, "I have to change." The other sensations of neural activity that ordinary people call their personality or soul is the same kind of molecular activity that makes people overeat. The sensation of I is just more neural activity but it appears to be different and gives the sensation of freedom through the ability of Line-level consciousness to chop up the continuum of reality into sentences with periods. People are left with, "There is some freedom because all of me is not a drunk. The piece of me that knows this is proof that I'm free." People cannot hear the question: From where does the motivation come for these voices and sensations in you that say, "the other part of me should .pachange."? If they could, what appears to be one's consciousness would be absolutely overwhelmed. It would have a cosmic blowout. Under ordinary conditions you cannot remember this question. Once you get involved with This Thing, there is an unexamined sensation of, "I'm onto a certain amount of freedom because there is a piece of me that wants to hear these commentaries and pursue the suggestions given." Then where does this other inspiration to seek change come from? Your forefathers would have said, "There is a godly part, and then there is an evil part that wants to live on twinkies and vodka." But for the Few people it is a question of, "From where does the molecular, biochemical activity in you come that says, 'I eat too much'? From what neighborhood could such a comment possibly arise?" Ordinarily, people cannot deal with this question. They cannot deal with it because such a question challenges the binary basis which makes consciousness even possible. The challenge lies in the fact that the "I" which wants to change, and the part of a person resisting change, is a duality supporting Line-level consciousness. There is nothing wrong with things as they are. All of Life is just right, perfect. Unless you're ordinary, but then you don't belong in This. The assumption of an "I" and another part which needs changing in oneself is similar to the belief in good and evil, in the conscious and the unconscious mind, and the belief that people can be more humane or less humane. These are not fallacious beliefs. This is binary consciousness. You would never have been conscious in the ordinary sense of the word were you not wired-up -- not through environment, parents, or religion -- in such a way that the biochemical activity in you producing the sensation of individual consciousness is synonymous with two sets of teeth, two eyes. Humanity now considers the computer to be the supreme work of art from science and technology. But it is also acknowledged that computers can only count to two. All this means is that the people who invented it can only count to two. If they could count to three, the computer could count to three. The work of art, the end result, cannot surpass the person who produced it. If you're worried about machines taking over, you should consider whether you ever met another human who seemed intelligent enough to take over the universe. What seems to be consciousness cannot define itself, or even report to you any description of what it is. With all the ideas floating around that a man should know himself (and you see this in personality tests, job placement tests, astrology, and religion), you should find it curious that there is a continuing need for someone to "tell me what I am." After forty years of people living with this thing they call "I," people still want to ask someone else to tell them what's wrong with them. Again I remind you, this is not an attack on the world of academics or psychology, or any part of Life. Things are supposed to be this way. Consciousness seems to be what a human is. Consciousness would seem to be the mortal human source of your thoughts, feelings, sensations, and imagination. But consciousness, without giving any biological definition to it, is like a knot tied in a rope. A knot apparently is a "something." It even has a name: there is a noun for it. You can apparently loosen a knot and move it about the rope, put it in the middle or pull it down to one end. And yet, there is no such thing as a knot. There is a routing of the rope and that is what is called a knot. Yet everyone would swear there is such a thing as a knot. Working at the binary level, everything eventually is going to become a noun, a thing. But is the reality not more like a process? The knot apparently moves and can be seen, but you cannot have a knot without a rope. You can have a rope without a knot, and the knot can be loosened to such a degree that it can't even be seen. The knot is a process that has been looped into a certain position. Is this another form of the great Regal Collusion? In attempting to see the thing that everyone calls their consciousness, what can you make of the sensations and perceptions you have gained by trying to observe and study this phenomenon? Why does none of humanity find it worthy of investigation that there is a continuing verbal response to any and all questions? Someone asks another person a question and the person has an immediate answer. Yet where did that answer come from? Even if it's outside of a person's field of experience, some remote subject of microbiology, the person has an answer of some kind even before the question is completed. Consciousness has never found it to be of any interest that everyone immediately has a verbal response to any question, be it pertinent or not. Someone walks up to you on the street and you have no idea what the question is going to be, but there's no doubt, no matter what they ask, a response will be forthcoming. I ask again the question: "What are you going to say next?" and point out that if you understood the question, you would never again be what you are. Is it possible that people always have an answer because everyone already knows what the question will be, before it's even asked? Is the Regal Collusion at hand here? Whenever there seems to be some insanity (as it's ordinarily called) sweeping some country, whether it be in the form of terrorism or attacks on their neighbors for imaginary religious or racial causes, people say, "It's because of their leader." But it's not. There is simply a large molecular activity occurring in a certain area in the body of Life. The sensation that, "what I know, I know personally" or "what I feel, I feel personally," is not the limitations of individual consciousness. It is a function of you being a part of a greater molecular activity. When the parade goes by playing the national anthem and brings a tear to your eyes, large numbers of people are feeling the same as well. You're living in a body that is alive. What is taking place is not a personal life of sensation or thought; rather, is part of a greater molecular activity. When you feel angry, it is not simply "you" feeling angry. It is a larger scale of molecular activity that is translated verbally in man's mouth as anger, patriotism, fear, or hostility. It is the height of dumbness for anyone interested in This to take these sensations .paas "my feelings" or "my opinions." To do that is to eat everything in a binary fashion. This does not mean that just because suddenly you feel afraid of death, everyone in your neighborhood feels the same simultaneously. But what happened was not an individual personal experience. Did you plan to have that fear? Then where did it come from? The fear did not come from "out there," for there is no "out there." Whatever is happening to you, is happening in Life. Whatever is happening in Life is in some way happening to you. Subatomic physics offers a splendid parallel to what I have said about Neuralizing. When electronic "photographs" of subatomic particles are printed, they have to be put out of focus to be seen. If they were left in the focus that the electron microscope saw them, the particles would be invisible to the human eye. They have to be shifted out of focus to give them the appearance of being something. Neuralizing is being able to remember something without thinking about it, being able to see something without looking at it. Staring, or being ordinarily conscious, makes anything invisible. You've seen it before, and you don't see it anymore. You don't see the people you're living with, or what you do everyday, or even what you look like in the mirror. You can't see your surroundings or anything else, because it's all invisible. Staring, which includes pondering and studying, is the neural processes in you electrically and biochemically running the same old routes, with the same neurotransmitters connecting at the same junctures. Life has even almost let ordinary people know this. The following scenario is often heard: A scientist is working on a problem that has been plaguing him day and night and feels at a dead end. Then he does something else, like moving a rose bush in his garden, and suddenly the solution comes to him. What has happened is that he quit staring, and what was apparently the problem on his mind got out of focus. You almost have to take that which you are trying to see and put it out of focus. When you try to study and ponder something, it seems to go back and forth like a ping-pong balls -- "now I've got it, now I don't". You must push the whole thing out of focus into an unknown third area, wherein you are not, in the ordinary sense, any longer thinking about it. Thinking about anything runs its course very early in a person's life. By the age of six or seven, fresh creative thought is finished. Since then you've been running on ordinary energy. You don't need an electron microscope to see this. It's not a matter of looking at some so-called problem or situation in your life or within you and expecting to figure it out. What you are trying to study is invisible, and not only do you not find a solution, you never see what the problem is. You don't see the basis of what you consider a problem. You must get it out of focus and get away from your two binary eyes. The ideas echoing from old religions about developing a third eye almost coincide with these kinds of things. You can only see when you stop the stereoscopic vision of two eyes and add a third eye. All around you are things that you never see because you stare at them and they're invisible. Recently I gave out the phrase, "If it moves, poke it." Part of what is to be inferred from that is the necessity to scan and investigate, to neuralize far and wide. There is no sacred ground or holy exceptions of what to poke. You are wired up to molecularly react to something that you hear or read about and it enters your own neural activity. Then, to you, it's alive and it moves, be it religion, social injustice or the heartlessness of women. (Off the subject so you think, but note that it is men who have continued to write and talk about how women can't be trusted, not women saying that about men.) Anything that moves has got to be a subject for your attempts to See. Notice how much of life seems to be non-moving because to you it's invisible. You don't even notice it anymore. If you look around at the places in your neighborhood through which you drive, or the physical milieu of your office, they are now just backdrops. If you look around at it, it will move. And if it moves it deserves to be poked. As long as you're living at Line-level consciousness, Life is almost invisible. Why do people seek entertainment or go on vacations? What is the motivation if not to make something visible again and make it move? But then notice how little you can stand of that. The average person lasts only a short time in a foreign environment before checking into a hotel run by his own countrymen. This is not an attack, because humanity is doing just what it should. You are accustomed to it, as you're supposed to be. The arrangement is quite efficient. But it renders almost everything motionless...People, or large movements of people going on, are invisible to you, and you take them as being personal phenomena flaring up in you. You don't see that things are moving because, if they are invisible, they don't move. If you're staring at them through ordinary stereoscopic vision -- binary thought -- everything becomes invisible. You pass the time of day without really seeing your family, the people you work with, or people you pass in the street. It's a great beautiful miracle that all this takes place, and that it's all happening almost invisibly. You're reading the first page of the newspaper and unless something is really moving, someone can ask you a minute later what you just read and you don't know. The light waves picked up words, and apparently information came in, but it was invisible. Yet if nobody points it out, you are apparently doing something. The input is not digested or chewed, and it does not nourish. I don't mean that information in the paper has any intrinsic nourishment, but it's not possible to be nourished from any kind of new information unless it is willfully, carefully chewed. It cannot be seen with only two eyes.